In the years after the war, the Hirayama family, headed by successful author Heishiro, begins searching for a husband for their daughter, Kiyoko, whose childhood nickname was Anzukko (Apricot Child). Eventually, Kiyoko accepts the proposal of a neighbor and aspiring writer named Ryoichi, and they move to Tokyo. However, Ryoichi proves unable and unwilling to hold down a job, and soon, they’re living in poverty. Ryoichi tries to sell his stories, to no avail, and becomes increasingly distraught over his father-in-law’s success as an author, often taking out his frustrations on his wife. Kiyoko becomes increasingly disenchanted with her marriage, repeatedly returning home to her family, as her husband's psychological distress proves too much. 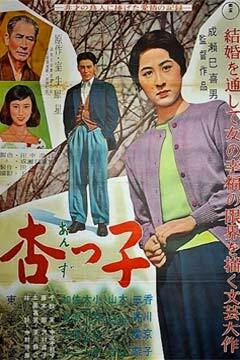 Based on the novel Anzukko (杏っ子) by Saisei Muro, which was serialized from 1956 to 1957. Toho submitted the film to the US copyright office on December 10th, 1997 with the registration number of PA0000889324. The copyright registration was a triple claim, as it also included Hiroshi Inagaki's Ninjitsu (1958) and another Naruse film, Summer Clouds (1958). This was the last film in director Mikio Naruse's career to be photographed in the standard academy aspect ratio (1.375:1). Beginning with his next film, Summer Clouds, all of his pictures would be photographed in widescreen TohoScope.